In seconds we’re all on deck facing down a 100ft x 100ft ice flow that has wedged itself up against our bow. It’s being pushed hard from the storming wind and is moving directly over us. We try to release our anchor but it’s stuck as this multi-ton piece of ice some 30-40ft thick has positioned itself above it and is making it impossible to retrieve. We push the bow away to gain a few meters of slack to loosen the anchor but it’s of no us. The ice sheet is being pressed against us and we can’t move. Our anchor line becomes steel cable tight and the boat begins to moan under the strain. The nose of the bow starts to drop, being pulled down by the anchor line and the weight of the moving ice. We need to do something immediately or we’re going to be swept under the ice. Within an hour the storm is upon us and the sea builds wild again. The shoreline is steep and rocky and no place for a surf landing. This makes for a few tense minutes negotiating breaking waves and strong winds until we find shelter in a tiny gravel lee – as hostile and exposed as a lee can be – and some protection from the storm. We spend the rest of the evening rocked by the sea, a growl of any angry gale our only company. By morning the wind has died again and it’s easy going for three hours until once again a menacing grey mass begins to build in the north west. When the wind storm hits we are about half way across an exposed 15km traverse from one headland to another. The push from the wind is so hard that we can’t keep our line and we’re swept into the open waters of Sellwood Bay. We’re moving in the wrong direction so we elect to drop the sea anchor to slow the negative push. A sea anchor works like an underwater parachute and, depending on it’s size and drag, can stop a boat in the water or significantly slow its movement. Our sea anchor is too small for the job and allows us to be pushed at nearly 1km/hr towards the far shore of the bay. We retire to the cabin knowing there’s nothing we can do but wait. As we’re slowly pushed to the far shore of Sellwood Bay the depth of the water becomes shallow enough to deploy a ground anchor allowing us to replace slow negative movement with no movement at all. A quick scan of the horizon indicates no ice and we all lie down for some rest. This chunk of ice that appears across our bow is completely unexpected. There had been no ice around us when we retired to the cabin an hour ago. And even if there had been, we present such a small bulls-eye on a such massive target that the chance of a piece of ice actually hitting us seemed very remote. Somehow this big chunk of ice has found us. The groaning of the boat and the dipping of the bow leaves us no choice. Like having your coat tails caught under a steam roller, there’s only one outcome here. I pull out the serrated knife from my PDF, crawl to the bow of the boat and cut the anchor line. “Ping” The rope is as tight as piano wire and explodes with the touch of the blade. We spring free. We’re a couple kilometres from shore and the wind begins to push us in quickly. One dilemma switches to another as we sail head long towards a rocky beach with no anchor to keep us off it. As we get closer we do everything in our power to keep ourselves away but it is all a matter of time. With wind unabated we’re forced to find as smooth a section of beach as possible and head in. The moment the bow of the Arctic Joule runs up onto the gravel we jump out and prevent the stern from swinging broadside to the waves. The water is waist deep and icy cold and we take turns standing in it to keep our bucking bronco from breaking free and breaching. Just when all seems hopeless another ice flow appears a few hundred meters off shore heading in our direction. This one is smaller than the behemoth we tangled with earlier but still carries enough girth to be imposing. It will be on top of us soon. 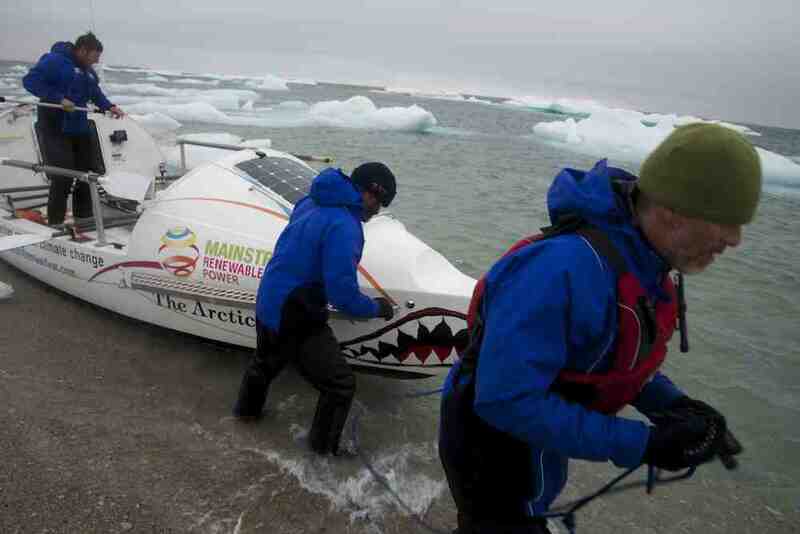 We make a sharp effort, push off from shore and head into the lee of the incoming ice. It becomes grounded on the seabed as we had hoped and we take the opportunity to use it as a moorage. Clambering atop the slab we place two ice screws into the ice and are able to rig a satisfactory anchor – in reality an ice climbing anchor – that we hold fast to. 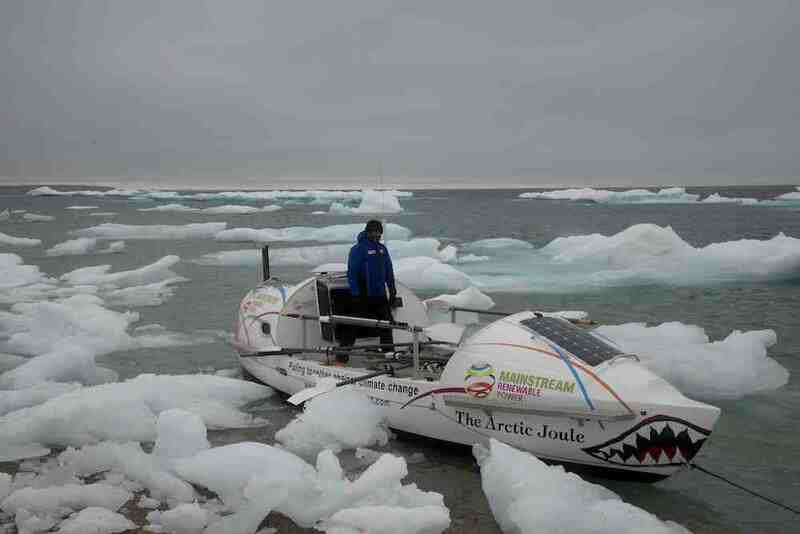 We’re in the lee of the ice a short distance from shore and safely out of the wind. Denis is a secret fan of the 80′s pop rocker Chris de Burgh and on a number of occasions after particularly challenging days on this trip has threatened us with a serenade of a de Burgh classic. He’s so happy with our mobile ice moorage that he names it Chris, Chris de Berg, the iceberg that is. Moored to Chris, out of the storm, we take a deep breath after our ordeal but no sooner are we out of our drysuits do we hear a thundering crash outside and a thump against the boat. Chris is disintegrating, pounded from the waves. As he breaks up he may twist, tumble and somersault and we’re attached to him. It’s another mad frenzy of donning drysuits, leaping onto a disintegrating berg to free ourselves and then be cast again into a breaking surf and winds. We’re at wits end and start rowing intensely a mere meters from shore. We put ourselves on 20 minute shifts, the effort required being so high, and just to keep going. Over the course of several hours we creep along the edge of shore and discover a tiny bay partly choked in ice that will provide us protection. We slip in to our safe harbour, finally out of the wind and out of the storm.